Westfield in Bloom: You Grow Girl! 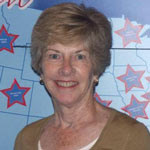 Barbara Vincentsen, a Westfield resident, has become a judge for the 2011 America in Bloom competition. She is the owner of Vincentsen Associates, a medium-sized award-winning architectural firm that operates locally. Barbara comes from a gardening family and has continued her family tradition in her own gardens, which have plantings shared from three generations of close family and friends. Her garden was featured in last year’s Westfield in Bloom program. Barbara is a licensed architect in New Jersey, Pennsylvania, and New York, and is a licensed professional planner and certified interior designer in New Jersey. She is actively involved in the community, serving on the boards of the Friends of Mindowaskin Park Committee and Fairview Cemetery Committee. She is a member of the Westfield Service League and Downtown Westfield Corporation Design Committee, and a past president of Central Section of New Jersey Chapter of the AIA. Her job as an America in Bloom judge entails writing a detailed evaluation highlighting strengths and listing areas of possible improvements. This position requires extreme dedication and expertise. We are very proud to have one of our residents become closely involved with America in Bloom, an association that Westfield has partnered with for the past two years. Barbara’s dedication to both our town and the nation-wide campaign serves as a model example.